Brokermint is a real-estate back office management software which supports a number of key features including transaction management, commission tracking, offer management, and integrations with QuickBooks, MLS, and CRM systems. Designed to streamline real-estate management, Brokermint’s full-service platform also provides electronic signature capture, automated checklists, dashboards and reports, API access, and white label branding. With e-signature and document management capabilities, users can access and sign documents online. Document and checklist templates aim to enhance user productivity, and customizable reports and dashboards give users insight into their brokerage pipeline and overall business performance. Audit trail and transaction archive features ensure users maintain detailed activity logs to maintain full compliance. Transaction and commission management tools help users track listings, pending sales, and rent/lease transaction information, in addition to managing agent commissions. A customizable automated reminder system allows users to stay up-to-date on multiple transactions, listings and checklists, while a multi-tiered review process enables users to review and approve document submissions. Brokermint’s centralized platform allows users to store agent profile information, documents, assigned commission plans and notes in a single location. Customizable permissions ensure only authorized users can view certain content. Integration with accounting, CRM, MLS and file storage systems, including QuickBooks, Salesforce, RESO/RETS, Dropbox, and more, help to encourage user efficiency. It's the best solution out there for what I need... but still needs some work. Though I have my frustrations because the transaction creation process feels laborious and clunky... overall I like the platform, features and what it allows my business to do on the backend for document compliance, agent on boarding and a resource for our agent with the Library.The aesthetically pleasing look of the platform & it's functionality. Specifically being able to manage & review contract documents plus easily calculate commission break downs on each transaction. I am also a big fan of the Library, as I'm using it as a type of "Intranet" for my office resources & training docs. The aesthetically pleasing look of the platform & it's functionality. Specifically being able to manage & review contract documents plus easily calculate commission break downs on each transaction. I am also a big fan of the Library, as I'm using it as a type of "Intranet" for my office resources & training docs. Brokermint does try really hard to accommodate smaller companies' business models. Their recent updates have improved the ease of usage for agents overall. Sometimes though, they update and move links/filters so often, that it's hard for the agents to figure out where the things they were used to seeing on one screen is now on another or in a different widget. I also find myself (Admin. )looking for tutorials and/or help guides to the new things they update. The announcements are good but again, the language is not always understood without further research into what it is has changed. Trying to get live support has begun to get harder. A live chat gets passed on to several people which then prompts me to filter through 2 to 3 different answers before getting what I need out of the initial inquiry. Reports is something that we've been working with Brokermint on since inception- we'll get there!As far as I understand, Brokermint is not software, it's an internet based program - unless they are looking to get into that field? Initially, what I like most was how different it was from other programs we were using. The ease of initial transaction entry and agent usage capabilities is what took us over the top. As far as I understand, Brokermint is not software, it's an internet based program - unless they are looking to get into that field? Initially, what I like most was how different it was from other programs we were using. The ease of initial transaction entry and agent usage capabilities is what took us over the top. Initially, it was the understanding that much of the wording (colored differently) was a link to other pages or filters. There are no buttons or boxes to click on as people are used to. That was/is hard for a lot of the agents to grasp. Also, a lot of the dropdowns were not editable and the verbage is different in each state so we had to pick whatever was closest. When Brokermint updated the program to include these, it made the transaction editing easier - but all the previous entries still have the original wording. So if you're trying to find an archived trans. those filters don't work. When trying to communicate these issues to the staff/programmers via e-mail/chat; a phone call would always have to follow because the description language was different and we couldn't understand each other's needs/solutions without describing it live (it's good that they made themselves so available) but it took weeks to get to that point/resolution. Brokermint is THE transaction management solution for our firm. At the time we switched to Brokermint, we had been dotloop users for years in a marketplace where dotloop was not commonly used. It worked good enough for transaction management I suppose, but at the time, there was no way to apply a checklist to a transaction (each task had to be created manually) and I didn't have a way to track commissions and get that information over to QuickBooks. Brokermint changed all that. We evaluated several competitors and kept coming back to Brokermint as the all-in-one solution we were looking for. We create transactions with MLS data, add a checklist with all items properly assigned to the person responsible for the task, push to google calendar, track commission, e-sign, review files prior to closing, and when all finished, push it all to QuickBooks for quick payment. It has transformed the way our back office runs.Having the ability to track commissions inside the system, and then automatically push that information to quickbooks is a godsend. It makes tracking and paying commissions stupid simple. If you've been using excel or calculating commissions by hand, this alone will save you hours each year. Having the ability to track commissions inside the system, and then automatically push that information to quickbooks is a godsend. It makes tracking and paying commissions stupid simple. If you've been using excel or calculating commissions by hand, this alone will save you hours each year. Most of the cons I experienced early on with the software have been addressed with updates over the time (2 years) that I've been a customer. The one thing I wish the platform did have, is the ability to customize a message when sending an e-sign request, and the ability to create signing template "overlays" as in my particular state, the state forms are each serialized, so the form has to change each time, and the template solution in place today doesn't work well with that. Creating reports and auditing are so much easier in your new version. This saved us so much time in accounting. The agents are also able to keep up with their production so much easier. Great product we will use instead of the Century 21 platform they suggest. Your's is so much more robust than any other system.It has great reports tied to nice data entry points. I like that has customization in many ways. Competition doesn't allow the addition of fields like you do. The ability to make fields mandatory is very nice. When you made the reports where the user could use any of the fields to create new reports that took it over the top. It has saved me so much time and money being able to create a field and then report on data in that fields. Awesome, thank you for a great product. It has great reports tied to nice data entry points. I like that has customization in many ways. Competition doesn't allow the addition of fields like you do. The ability to make fields mandatory is very nice. When you made the reports where the user could use any of the fields to create new reports that took it over the top. It has saved me so much time and money being able to create a field and then report on data in that fields. Awesome, thank you for a great product. The import of information from CINC is a little scarce. I wish the MLS data would migrate with the lead along with the lead source and a few other fields. If it were customizable that would be great, but to have the property information come over would be a great start. I would like a menu at the top of pages where I could quickly go to the page I wanted. Right now I hit back and it takes me to the Transaction page. This is not always where I want to be. Viewing reports is a little cumbersome. I have to export to excel to really get a useable view to work with. I do like the content of the reports however. Overall, I'm happy with Brokermint. Their competition kept telling us it's for very small brokerages, but we haven't had any issues with 120 to 130 agents, and I don't see why it couldn't handle more. If you take the time to set everything up correctly before letting agents use it, they will love it. It's very easy to use after getting it set up correctly. We have over 120 agents, and I don't spend a lot of time answering questions. If an agent comes to me with a Brokermint problem, it's usually because I got one of their settings or permissions wrong, and that's on me. I can create reports with a simple drag and drop menu of fields. I can create new fields and incorporate them into reports. Everything can be exported to CSV / Excel. Customer support has always been immediate, whether by phone, email, chat, or screen sharing. It's very easy to use after getting it set up correctly. We have over 120 agents, and I don't spend a lot of time answering questions. If an agent comes to me with a Brokermint problem, it's usually because I got one of their settings or permissions wrong, and that's on me. I can create reports with a simple drag and drop menu of fields. I can create new fields and incorporate them into reports. Everything can be exported to CSV / Excel. Customer support has always been immediate, whether by phone, email, chat, or screen sharing. Nothing major. It would be nice to have triggers that cause events. For example, if no one switches a transaction to closed, we aren't prompted to pay commissions. It would be great if we could be prompted to pay as soon as the broker approves the final required document in the checklist. As it is, we assign the brokers responsibility of switching transactions to closed after approving the final docs. This is to prevent the agent from having to revisit the transaction after submitting everything and getting it approved, just to switch it to closed. There are a few other things that I wish could be automatically triggered. Most of the cons I have would be a matter of convenience. Pricing is based on the number of seats required. Simple Start: from $79/month for 5 seats. Standard: from $129/month for 5 seats. MLS (multiple listing service) and CRM (customer relationship management) integrations allows users to streamline all business listings, transactions and contacts. QuickBooks integration enables users to sync important accounting data and create accurate invoices, bills and checks automatically. Users have visibility into their real-estate transactions with email checklists and reminders, plus compliance review and automatic notification tools. White label branding enables users to customize the look and feel of the Brokermint system to their corporate style, as well as create branded email notifications. Custom commission planning tools allow users to track, manage and automate complex commission structures, agent statements, disbursement forms, and deposits. Below are some frequently asked questions for Brokermint. Q. What type of pricing plans does Brokermint offer? Q. Who are the typical users of Brokermint? Q. What languages does Brokermint support? Q. Does Brokermint support mobile devices? Q. Does Brokermint offer an API? Yes, Brokermint has an API available for use. Q. 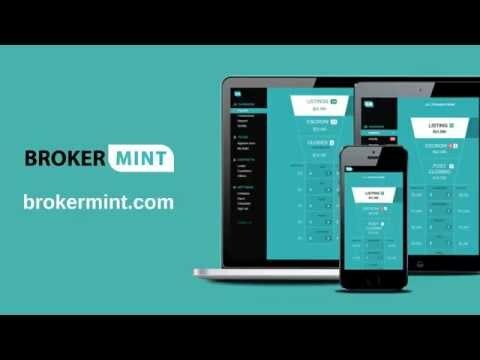 What other apps does Brokermint integrate with? Q. What level of support does Brokermint offer?